Browse through our Maui Wedding Photographer list below. Maui is the wedding capital of the world. Being the # 1 wedding destination, we have more wedding photographers than any other state in the nation. Below we have listed many of them for you to choose from. Click on their links to see examples of their work as well as contact information and full descriptions. We recommend you look thoroughly through all of the wedding photographers before choosing. You'll find many different styles of photography by these Maui photographers of whom range in price and availability. Natalie has extensive experience with intimate beach weddings as well as large all-day celebrations. She is dedicated to capturing all the best memories from your wedding while also paying attention to the details. It's important to feel comfortable with your photographer, which is why she put extra energy into making your portion as effortless as possible. At A Maui Beach Wedding our thoughtful approach to your Maui wedding will result in images that preserve forever all those once in a lifetime moments. Contact us today for the best availability. All major credit cards accepted. Continue in to see more photo examples as well as get contact information. I strive to create meaningful and lovely photographs, paying close attention to every detail of your day. Your wedding will be expertly documented with timeless, thoughtful and exquisite style. Read a more and see example photography by continuing to the next page. Soulful and timeless photography for your Maui wedding. Your beautiful and unique love story told in lasting images your family will treasure. I love capturing your day with authenticity and allowing your day to unfold naturally. I would love to hear from you about the day you are planning! 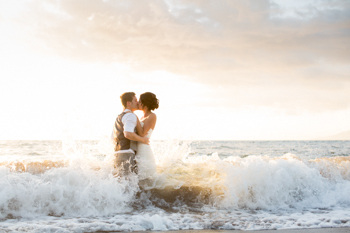 Caitlin Cathey is a professional wedding photographer based on the island of Maui, Hawaii. Caitlin specializes in weddings & elopements, and has a timeless, fun, romantic, & happy posing style, and describes her work style as easy-going & friendly, but also direct & attentive. With over a decade of photographing hundreds of couples from diverse cultural traditions, Melia Lucida makes it her priority to capture real, unposed moments and beautiful light. We her expertise, creating an authentic and evocative collection of imagery becomes natural for brides and grooms. Amy is a natural light photographer based on the island of Maui, Hawaii. She strives to create natural, and emotive images that perfectly capture both the feeling and beauty of your day. Capture Aloha Photography offers a small team of affable, talented photographers who mix creativity with fun to document your wedding’s most gorgeous and enjoyable moments. With over fifteen years of experience, and equally adept at recording posed photographs as candid shots, they specialize in color, natural light, and off-camera flash, making them an excellent choice for sunset ceremonies. I'm Chris and capturing your love, passion and individual style is what I love to do. From dreamy fantasy to edgy fashion style, I cater to creative and eclectic couples seeking unique wedding photography. I have shot fashion and editorial for over 10 years and am now so excited to be shooting weddings. So hey, let's have some fun and make some amazing memories together! Light, location and technique blend to create that special image that will be a lifetime reminder of your special moments; but, don’t forget to have fun. I specialize in relaxed portrait sessions, engagements, intimate weddings and other happy events. I would love to be your Maui photographer!